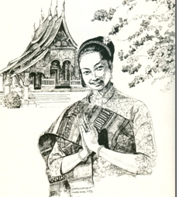 This chapter is designed to provide the reader with a feel for the old Lao poems — more so about what they mean than about how they sound—and some of the photos of significance to the Lao nation during 1960-1975. Crossed by the Mekong River and clean highways. It was cool and refreshing. I don’t make noise when told so by the teacher. My friends sit in rows; we don’t talk loudly. Are like blind eyes that cannot see and tell you where to go. I go in and pick him up, like my mother would. After dinner, I read and not play around like I used to. Life in urban areas means careers but is not very lively. Birds are noisy; and dog barks are not worth paying attention to. To marry a young wife is like taking care of nine old cows. To marry an old wife is like taking care of nine mothers. A mother-in-law treats her daughter-in-law like a devil.